So I just bought my first bike, to be my winter project and I will be riding it next spring. It's a 96 cbr 600 f3 streetfighter. The only problem with it is the headlight thats on it is so dim my phones screen is brighter I bet, and the speedo thats on it doesnt work for anything but blinkers and when your in nuetral.. So I'm curious what you guys think would be a good looking light system and speedometer/tach. It doesnt have the gas gauge hooked up either but he said all the wires were there for it.. Any tips for anything would be much apreciated, Im new to all of it. Ive got lots of experience on snowmobiles but not so much on bikes. Thanks in advance! Pics to follow soon. f3's don't have a gas gauge. it's all by mileage. if it's an acerbis or ebay equivalent - it's going to have terrible lighting. as far as a better light, i'd look into making your own projector light. you can find some kits out there that are fairly cheap and they'll light up great. that's a good idea. if i remember right, you'll have to figure out some things that don't quite mix with the f4i gauge, and i think the temperature part is one of them. You need the 99 900 temp-sensor to go with the digital read-out. The hardest part is the physical mount of the guages, that's where the creativity kicks off. I did mine to maintain stock look with the fairings. So on top of the gauge I need a 9 pin connector and a temp sensor and thats it? Right now all I have for a speed sensor is this magnet thing on my front wheel that doesnt work.. Im working on pics right now too. 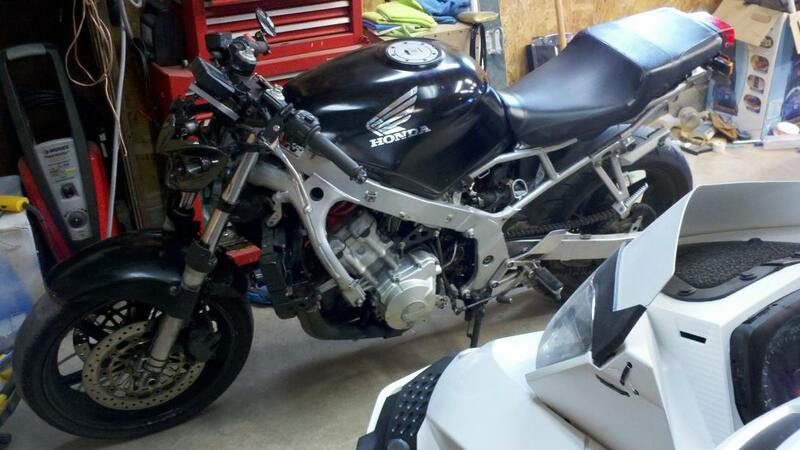 Pic of the bike as of now in my garage. You'll need 2 of the 9-pin connectors to hook-up the F4i guages. The F3 uses a send off the CDI for speedometer. I think ive decided on a pair of bi xenon hid projectors for headlights.. the thing that's on it now would melt with any higher watt bulbs in it and the projectors are amazing.